Australia's largest dedicated Organic and Vintage Fabric store! We have new stock arriving daily and will keep you updated on new goodies available, newest trends, fun competitions and bits and pieces from our lives. If you would like to view our amazing vintage fabrics you can visit our Vintage Fabric store www.vintagefabriconline.com. We love to see photos of your creations so don't forget to pop us a line and a photo if you would like to see your creation on your photo page on the website. This fabulous 70s inspired fabric is printed on 100% GOTS certified organic cotton and is available in 2 colourways in our store (all online this week). To enter just follow our blog through the link to the left (see Followers box) and leave a comment below. The lucky winner will win 4 fat quarters of this gorgeous fabric. Each fat quarter measures 50cm x 56cm. Winner will be drawn after the Easter break so good luck and Happy Easter! This would be awesome to start off a project I want to try for my daughter! It's gorgeous! They are great can't wait to get over to your shop and have have a look after the Easter madness. I have only just discovered your shop and I'm glad I did. that is such pretty fabric! That fabric is just gorgeous! It reminds me of clothes I used to wear. 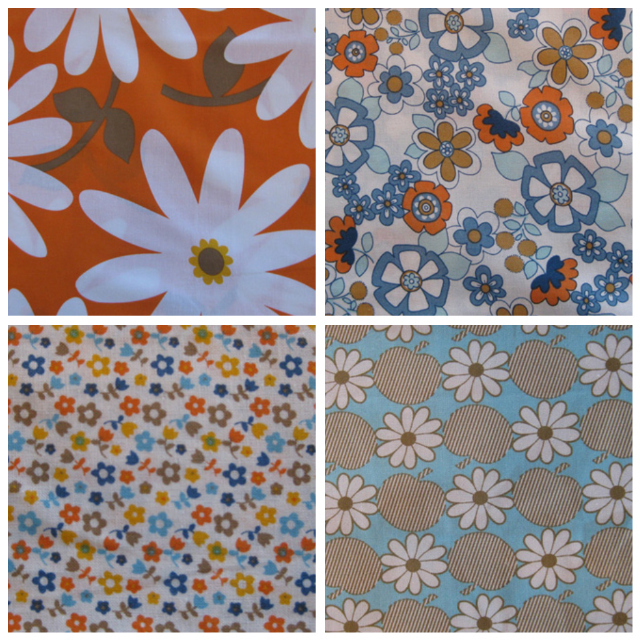 I was born in the 70's and mum has a lot of photos of her wearing these style fabrics. I would love to remake some of those dresses for my girls. Absolutely fabulous. I love it. cheers tam. Such beautiful designs! I love that the fabric is organic too. So many possibilities of what they can be transformed into. I love the fabric. Count me in the giveaway. would look fab made into bibdanas for my kids! LOVE your fabric!! Just Gorgeous! So lovely, colours are beautiful! Yay - they are super pretty. The fabric is so pretty! I love all things crafty and this fabric definately inspires creativity!! So pretty!! I love all things crafty and these fabrics definately inspire creativity!! Oh wow, they are all gorgeous! What gorgeous fabric - I love it! Oh, what beautiful fabric! Thank you for the giveaway! I am proud to admit I am a member of FunkyFabrixaholics Anonymous!!! I love Funky Fabrix!!! I was an anonymous follower but not anymore! Thank you! Loving those colours - thanks for the giveaway! I hav ethe lower left one in green, but BOY is it lovely in white as well! pretty please with cherries on top, love these fabrics. Very nice and a great name (just joking). I am already a follower. Loving the threads, what memorable designs! I need some girly fabrics for me - these would be purfect!! I want to make skirts for my daughter with these - just gorgeous! Delicious fabric. I think you need to create a new group "addicted to fabrics anonymous" or " is there such a thing as too much fabric?" . My life has been more interesting, fulfilling ( and maybe a little cluttered) since I found your shop and started shopping!! I love love love all of your fabulous fabrics. I feel the urge to quilt! Thanks for the competition. I would love to enter!!! On a rainy day like, I could use those lovely fabrics. Love that fabric and your site! Beautiful fabrics :-) I've got a few things in mind for those! I love all the fabrics coming out now with hints of times passed! Hope you've all had a fab easter! What a beautiful collection on fabrics,I would love to win them! Lovely prints and organic too! *Sigh* So many gorgeous fabrics, so many great ideas and not enough time! Counting down til my twins start pre-school in a week or so and then I will have sewing days! Woo hoo! I am now a follower! I am addicted to fabric shopping. WOW!!! The fabrics are fabulous. I'll keep my fingers crossed. Grab our button! Copy and paste the code below into your blog. Thanks for the support! May is here and so is the countdown! Vintage fabric of the week!